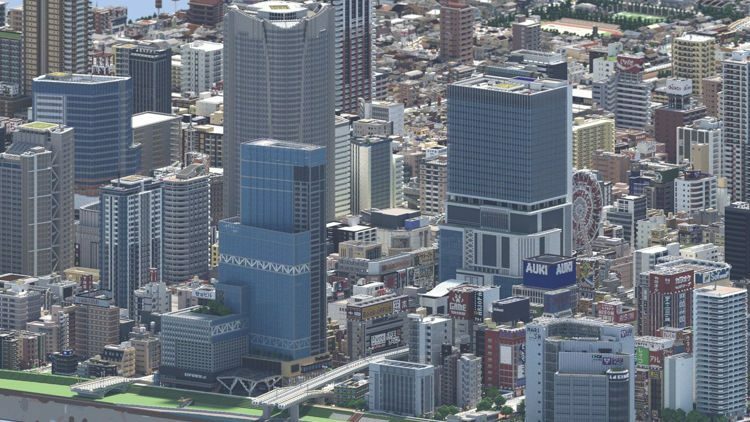 A group of Japanese Minecraft enthusiasts have spent the last three years creating an insanely realistic city in the popular block-building video game, and the results of their work have been leaving people with their mouths open. Sayama City was originally unveiled in 2016, on creative Minecraft community website Planet Minecraft, and got a lot of attention from fans of the game. The level of detail for every building shown in the feature video and in the uploaded photos was indeed quite impressive, with many people commenting that this was the most amazing Minecraft city they had ever seen. Well, the team behind Sayama City has been busy over these last few years and the latest photos of the fictional metropolis look so insanely detail that you could swear this was a real city. Skyscrapers, colorful advertising billboards, temples, arching bridges, even ferris wheels, they are all featured in the greatest detail, in Sayama City. When seen from a distance, it’s almost impossible to tell that this is a heavily pixelated Minecraft city and not an actual urban center in Japan. It’s not clear exactly how many people have been working on Sayama City over the last few years, but regardless of their number, their achievement is worthy of praise. Of course, there are those who can find faults in the most amazing things, and this Minecraft masterpiece is no exception. Some commenters on Reddit pointed out that this is technically a virtual sculpture, as none of teh buildings have a detailed interior that users can explore in-game, but let’s be honest, getting the exterior of every single structure in Sayama to look so realistic is impressive enough. I don’t even want to think about how much work the interior of each building would take. Then there were some comments about how the “Sayama Construction Committee” relied on tools like MCedit to speed up the process instead of building everything block by block. Well, considering the scale of this project, I’m pretty sure that is the case, but who can blame them for it as long as every little thing in Sayama has its own distinct look? With the attention Sayama City has been getting ever since an in-game photo of it went viral on Reddit, I expect we’ll see some updates from its creators in the near future.